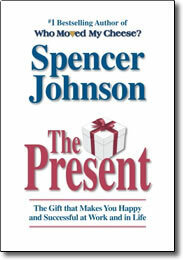 For over two decades, Spencer Johnson’s stories of timeless, simple truths have changed the work and personal lives of millions of readers around the world. Now comes an insightful new tale of inspiration and practical guidance for these turbulent times. The Present is an engaging story of a young man’s journey to adulthood, and his tireless search for The Present, a mysterious and elusive gift he first hears about from a wise old man.